Todd Marlo, a recent resident at MU’s College of Veterinary Medicine (CVM) received the Best Basic Science Manuscript award at the American College of Veterinary Ophthalmology conference, held in October in Baltimore. Marlo’s paper, “Altering equine corneal fibroblast differentiation through Smad gene transfer,” describes the use of gene transfer technology to silence profibrotic Smad, overepxress antifibrotic Smad, or a combination of therapies to control TGF-β1-mediated fibrosis in equine fibroblasts. 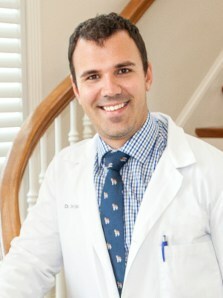 Marlo now works for Veterinary Ophthalmology Services (VOS) in Chattanooga, Tennessee, where he lives with his wife, Jessica, who is also a veterinarian. The couple met at a pre-Vet Club dog wash during their undergraduate days at Southern Illinois University. Todd Marlo received a doctor of veterinary medicine from the University of Illinois, and then completed a small animal rotating internship at MU’s CVM. Following the internship, he stayed at Mizzou to complete a comparative ophthalmology residency in 2017. Marlo began work at VOS in September 2017, so he did not attend the conference where his research was honored. “I did receive a very nice crystal plaque and a check for $500, so it was still pretty cool,” Marlo said. The ACVO awards are presented to residents at the end of their residencies, so there are no research stipends. “When I was at Mizzou, I was not a very research-focused guy,” Marlo says. “As much as I sometimes hated having to do the research, it really improved my residency. I understood the basic science of veterinary ophthalmology, but doing this research really pushed the boundaries of what I was doing and what I understood. I greatly appreciate the work I did with Dr. (Rajiv) Mohan and Dr. (Elizabeth) Giuliano. Marlo is the CVM’s most recent Ophthalmology Service resident to be honored for his research. During the past several years, ophthalmology residents have received six ACVO awards, a national Phi Zeta research award and a Missouri Foundation for Veterans’ Medical Research award. Giuliano, a professor and board-certified specialist in veterinary ophthalmology, also served as president of the ACVO Board of Regents from 2015-2016 and currently serves as chair of the ACVO Board of Regents Nominating Committee. Mohan is the Ruth M. Kraeuchi Missouri Endowed Chair Professor of Ophthalmology. Mohan, MSc, PhD, teaches ophthalmology and molecular medicine. A Fellow of the Association for Research in Vision and Ophthalmology, Mohan serves as director of the Ophthalmology One Health, One Medicine Research Program, director of resident research at the MU’s Mason Eye Institute, and as a health research scientist in ophthalmology at the Harry S. Truman Veterans’ Memorial Hospital. The study, “Altering equine corneal fibroblast differentiation through Smad gene transfer,” recently was published in the journal Veterinary Ophthalmology. Co-authors on the study include Todd L. Marlo, Elizabeth A. Giuliano, Ratnakar Tripathy, Ajay Sharma and Rajiv R. Mohan.